Tremadog, an exceptionally fine example of a planned town, was founded by William Alexander Madocks, who bought the land in 1798. At that time, the flat area surrounding the Glaslyn River was all salt marsh, with a few tree topped islands in it. Madocks was well aware of the possibilities of draining fenland, and set about building an embankment to separate the land from the sea. Madocks became MP for Boston n Lincs in 1802. His first embankment built in 1800 won the area where Tremadog now stands. By 1805, the first cottages for workers were built in what he called "Pentre Gwaelod" or "Bottom Village". (These are probably 1-9 Dublin Street). Within the year he had changed the name of the village to Tre Madoc or Madocks' Town. Madocks' agent throughout the project was John Williams, with whom he kept in contact by letter when away on parliamentary duty. These letters survive today and from them we can discover a vivid a count of the project's progress. Madocks' family originally came from Denbighshire although Madocks himself was brought up in London. As the youngest son he was not wealthy, but he had great vision. His ambition was to open up this part of Wales and raise its prosperity by improving road and later rail links and by introducing manufacture. The Union with Ireland of 1800 meant through traffic was now likely. 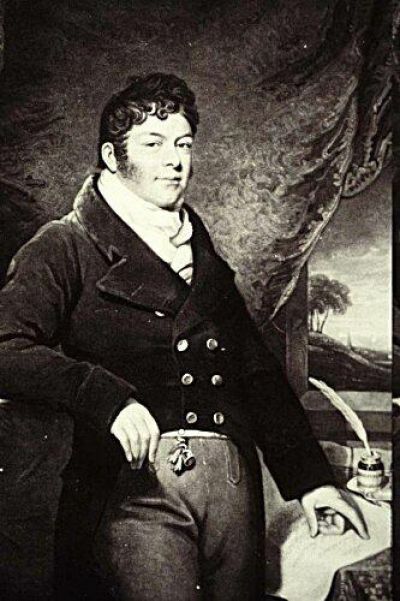 He promoted the building of Turnpike Roads; and to avoid the dangerous crossing of the Traeth Mawr (the estuaries of the Dwyryd and Glaslyn) or the long detour via Aberglaslyn bridge, he devised an ambitious scheme to build a great Embankment across the Glaslyn estuary. This was to become part of a rail link across mid-Wales to Porth Dinllaen (now owned by The National Trust) on the Llŷn which he hoped would become the main Packet Station for Dublin from London and the south of England. At that time the Menai Straits and the Conwy river were not bridged, but later his rivals succeeded in promoting the North Wales coast route and Holyhead became the principal port for Ireland. Tremadog is a brilliant example of Town Planning. Siting, layout, buildings and the resulting spaces were all designed to create the impression of a borough. Lacking the wealth to build it all himself Madocks wanted to attract people into his town to build within a strong overall plan. The most important part of the town was the Market Square. The back drop of the sheer cliff gave a theatrical effect to the whole area. The High Street and Dublin Street form the cross street at the top of the square, lined by the most significant buildings. These are the Town Hall and Dancing Room built in 1805; and the Coaching Inn. The Town Hall (now Siola shop) sits on a plinth of steps that used to extend across the whole facade. It has a simple beauty, with five round arched openings on the ground floor, the generously proportioned sash windows on the first, and the shallow pitched, wide eaved hipped roof above. The dancers would enter the first floor dancing room via the Tap Room of the adjoining Madocks' Arms avoiding the chaos of the Market Hall on the ground floor; and would dance to music from the minstrels' gallery facing the windows. The roof is typical of the Madocks' style - it is similar to that at the Manufactory and of his house, Tan yr Allt. Featured on the facade are six medallions, and the five keystones depict theatrical figures, hinting at the building's use as a theatre in the short summer season. The chapel is unusual as most chapels of that time were very simple, with a pulpit in the centre of a long wall, so all could hear the preacher. Peniel is in the style of a greek temple. The main facade is in stucco with a circular window in the pediment. The impressive portico was added in 1849, probably in accordance with the original design. The first gallery was inserted in 1840, and extended along both sides in 1880. The present ceiling dates from 1908-1910. St Mary's Church was finished 18 months after the chapel. 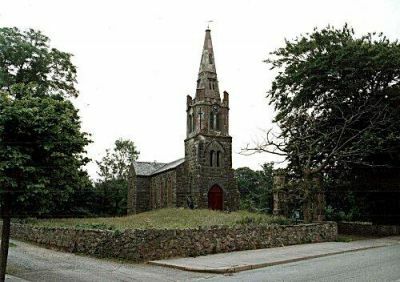 It is one of the earliest gothic revival churches in Wales dating from 1811. Originally it had box pews, paintings at each side of the altar, and cast iron windows throughout. These have all gone (the present diamond-leaded sandstone-framed windows are a late Victorian alteration. The Greaves Family east window was installed in 1899.) A plain brass plaque commemorates Madocks, and the wedding of a Mary Madocks to Martin Williams in the Church in 1811. A marble plaque commemorates John Williams, who died in 1850, his wife Anne and their only son, W T Massey Williams, all buried in a vault in the church. The church is romantically placed on an outcrop of rock. The entrance to the churchyard is a Coade Stone gate, shipped in kit form from London. The spire is brick, rendered in Parkers Roman Cement. Both Coade and Parkers Roman were early types of imitation stone. The bricks for the spire were probably made locally, the clay coming from Farmyard nearby. The importance of both the Gothic Church and the Classical Chapel is a good reminder of Madocks words "in education and religion all ought to have fair play". Madocks' vision for the town included Industry and in 1805 he built the Manufactory. It became the site for one of the first woollen mills in Wales where carding and spinning were powered. Beside the mill was the Loomery, where weaving took place. This building remains and was used from C.1835 as a Tannery. There was also a fulling mill and a corn mill, all worked by water power. The water was drawn from Llyn Cwm Bach created up above the Manufactory to serve a series of catchponds and wheels. As always Madocks was aware of the look of his buildings. The Loomery was designed with a roof very similar to the Town Hall, and with its rows of windows alternating with masonry, and two lower buildings flanking it, it was a handsome building. (The present roof is temporary). Madocks instructed that the mill should be "well yellowed" and the windows painted dark green. The houses of Tremadog had robust plain detailing and a typical plan with a central doorway and either a generous parlour or shop on each side with two bedrooms above. At the back a lean-to scullery ran the width of the house. On the Square two of these plans were modified for Inns; half the scullery had a stone vaulted roof so an even temperature could be kept in the dry cellar. The first phase of building on Church Street (originally London Street) ended at Ty Pâb. There was to have been a cross Street here, as the arches on the side of Ty Pâb indicate. Many gentlemen's villas were built in the area. Ty Nanney in Tremadog is an example, though lacking the ideal dramatic setting. Tan-yr-Allt was Madocks' own home. It has typically wide eaves, shallow pitched roofs and verandahs, with coved ceilings and a few gothic details inside. In the autumn of 1811 the Embankment (Cob) was finished. It had taken longer and cost more than anticipated, and Madocks' creditors were pressing for payment. Now, an end to the financial worries seemed assured, with a toll from foot passengers and carriages, and the income from the reclaimed land. A four day feast and Eisteddfod was held to celebrate the Cob's completion. Then in February 1812 high tides and a storm breached it. Madocks' agent and supporters held the creditors at bay, drummed up men and money from all around the county and finally repaired the breach and strengthened the whole embankment. By 1814 it was open again. But Madocks finances were in ruins and all his properties were mortgaged. The Caernarfonshire end of the Cob was anchored to a small outcrop of rock. To control the flow of water, Madocks had broken through the narrow neck between mainland and outcrop to fit sluicegates. The Glaslyn now ran along the back of the embankment, swirled through the sluice and scoured out a basin large enough to form a sizable port. Madocks had previously envisaged a port at Ynys Cyngar, two miles further down the estuary, and had included it in his Parliamentary Bill to enclose the Traeth Mawr, which won the Royal Assent in 1807. Now, in 1821, he obtained an Act for a harbour at Ynys y Tywyn, to be renamed Port Madoc. By 1824, he was surveying the possible train routes from Porthmadog to the new slate quarries at Blaenau Ffestiniog. Within a generation, the Harbour was busy, with slates from Blaenau Ffestiniog reaching the Harbour via the Cob, carried by the Ffestiniog Railway. This commerce fuelled the growth of Porthmadog. In 1826 Madocks and his family travelled to Italy for a holiday. 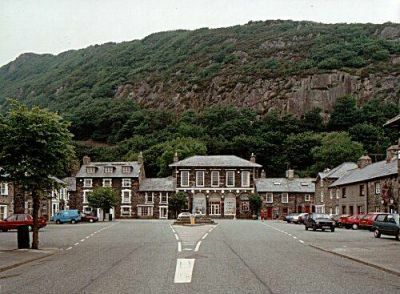 Madocks wrote home frequently, sending instructions to John Williams for the preparation of their new house Morfa Lodge, (now Gelli Fair) above Porthmadog, for their return. But on the way home in 1828 Madocks died suddenly in Paris. He was buried on 17th September in the Père Lachaise cemetery, Paris. His daughter Eliza Anne (Maria) Ermine was only six, so his estate was held in trust until she came of age. His wife returned to her childhood home near Brecon leaving the estate to be split by those who had helped finance Madocks' venture. The memorial to this remarkable man is the little town of Tremadog, still near perfect in its design and setting. In order to finance the construction and then the repair of the Cob, Madocks mortgaged all his properties and let his own house in Tremadog. His first tenant was the poet Percy Bysshe Shelley. Unfortunately, Shelley antagonised local residents by criticising their production of sheep for consumption, and by running up debts with local merchants. He departed hastily after an alleged attempt on his life by a nocturnal intruder at Tan y yr Allt without paying his rent or contributing to the fund set up to support Madocks. Please contact us with any further information on Shelley in Tremadog, or his relationship with Madocks. T E Lawrence, "Lawrence of Arabia", lived as a child at the property now known as Lawrence House, in Church Street, Tremadog. Please contact us with any information on Lawrence's time in Tremadog and any subsequent references by him to the town.